Amid all the other issues the legislature is likely to consider this session, terminal groins, shore-perpendicular structures built at inlets in attempt to slow erosion, might not catch the attention of most taxpayers. State law has banned these structures for more than two decades. But the debate about terminal groins is worth keeping an eye on, whether you live in western North Carolina or in a coastal community, because it could cost you and our state a pretty penny. A new study by Andrew Coburn of the Program for the Study of Developed Shorelines at Western Carolina University suggests that the benefits of groins in protecting beach homes from erosion are unlikely to outweigh the costs. Coburn’s report shows that using taxpayer funds to support the value of the relatively small number of threatened properties simply will not return enough tax dollars to make public funding worthwhile. Of course, in a private community like Figure Eight Island, residents there may elect to cover the costs of building a terminal groin to protect their neighbors’ investments out of their own pockets. This would be an altruistic gesture, but it would still be a bad investment for those who chose to live back from the beach. And make no mistake: groins are a bad investment. Their initial cost will run into the millions of dollars and annual maintenance can top $2 million. A state-funded study completed last year demonstrated that property down the beach from the groin gets no clear benefits. Nor could the study guarantee that towns with groins will save money in their ongoing battle to protect investment property. All the terminal groins examined in the study still required massive beach re-nourishment. These beach re-nourishment projects typically cost millions of dollars and must be repeated every few years. Beach communities often ask the legislature to help pay those costs with state dollars. SO, managing the shoreline around a privately built groin could continue to cost taxpayers money. The bottom line is that, while it may hold the tip of an island in place, a terminal groin will do so for the benefit of only a very small number of property owners at the expense of other private property owners and/or taxpayers. A wiser course would be to allow the free market to set property values for oceanfront homes that are located in chronic erosion areas. Constantly asking taxpayers (or neighbors) to protect a small number of poorly located homes through beach re-nourishment, sand bags and now terminal groins simply supports an artificially high value for those homes that does not reflect the risk involved in building in a very dangerous place. Many oceanfront property owners feel that the entire community (or the entire state for that matter) should pay to maintain a beach in front of their investments because “everyone uses the beach”. But, from a scientific perspective, it is not coastal erosion that has removed or narrowed the beach. The beach has narrowed because there is a building in the way of its natural, landward retreat. If there were no buildings, the beach would still be there. 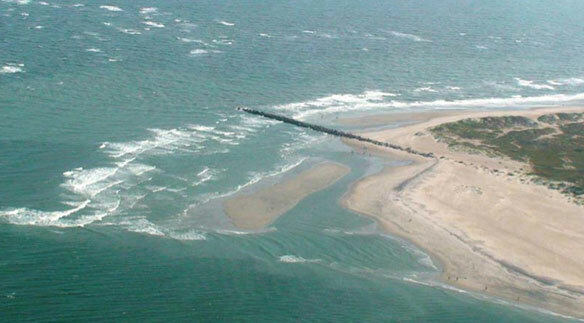 So, erosion doesn’t remove beaches, poorly located infrastructure removes beaches. Please don’t think that I am suggesting that we move all homes 10 miles away from the sea. I am not even suggesting that we get rid of oceanfront property. I am simply suggesting that oceanfront investment property located in chronic erosion areas and near inlets produces constant headaches for taxpayers. Sometimes, we all make a bad investment decision. Those individuals who purchased property in areas experiencing constant erosion and storm damage made a bad investment decision. I owned plenty of US Airways stock when they went bankrupt. I lost my shirt. I never expected my neighbors to bail me out. The same is true with oceanfront investment property. We can all feel sympathy for those individuals whose property is threatened, but taxpayers have no responsibility to protect those particular investments. Nor should our public beaches, which are owned by all of us, after all, be compromised to protect a small number of property owners. Doing so only makes things worse, and more expensive in the long run. So, if the state legislature decides to reverse state law and allow terminal groins along the North Carolina coast there should be no public funding available to aid in their construction or maintenance. And, private property owners who may then be asked to pay to protect their neighbor’s homes should think twice.